« What’s your gift to your partner? Are you bad at delegating? Are you trying to do everything yourself? It’s one thing being able to manage on your own and not have to worry about all the politics and consequences that come as soon one involves another person. Sooner or later there comes a time, however, when we need to reach out and rely on other people otherwise we end up doing all the work that we’re not good at and neglecting our own talents and genius. I’m guilty of this to some extent. But fortunately I do have some team members. And even though it can be frustrating sometimes for both parties I’m really thankful they’re in my life, driving me nuts at times but still helping me enormously. Not to mention the other advantages: connection, input and feedback. And learning to delegate or outsource smartly rather than micro-manage every detail is all part of the learning curve. But what if you can’t do this at all? the “It’ll do it myself” Thumb. How does this express itself? The day I dropped in everyone was happy and relaxed except Anne who was standing in the kitchen almost at breaking point. Turned out that she felt the waitress was too slow in turnaround. In her frustration she grabbed a teapot from the waitress and quickly filled it herself, thereby making the process perhaps 3 seconds faster than it might have been if she had simply relaxed and allowed the waitress to do it herself. Result: self torture and lots of anguish besides not being able to get on with her own more important work. Here’s what a “do it all myself” thumb looks like. Notice how high up on the palm the thumb starts. And then it juts straight out at 90 degrees. The positive side of this marker is self reliance. The dangers are too much self reliance results in isolation, lack of input and feedback from others as well as stress or even burnout. Let go of being perfect and embrace vulnerability, connecting with others and allowing them to help you. Learn to delegate – macro manage projects instead of micro managing every little detail. 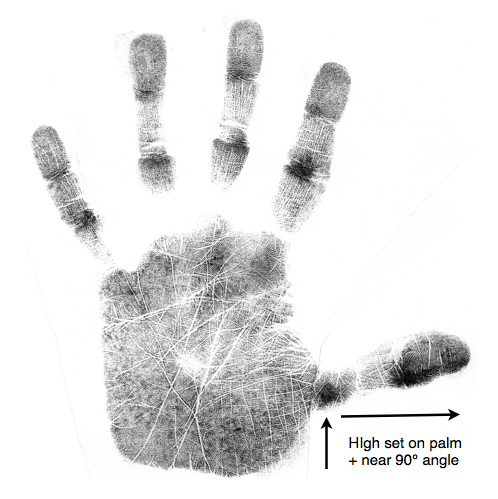 To learn more about hands join us weekly in Earth School with Richard Unger. Learn directly from the genius behind modern hand analysis, and in the process, stay current with all his most recent findings. 2 comments to Are you bad at delegating? I love your articles, I learn a ton, all fascinating. I’m a beginning student in hand analysis & I’ve been wondering about thumbs like this one. When I print my own hand I only get a sliver of the side of my thumb, whereas this print shows much more including more of the pad of the thumb, perhaps even some of the print on it. I never see the print on my thumb unless I print it separately. So what’s the deal with that? Thanks much for sharing all your experience, wisdom & especially for sharing the great info of other experts as well, you’re a fabulous resource! I always make the thumb print separately below the hand print. It’s almost impossible on most hands to see the fingerprint pattern without doing it this way. Also the middle section of the thumb (representing the third eye chakra) is full of information and when you print the thumb separately try to also get an imprint of this area for added information.